Located nearby are the neighbourhoods of SS2, Kelana Jaya (SS4 and SS5), and Taman Mayang (SS25). 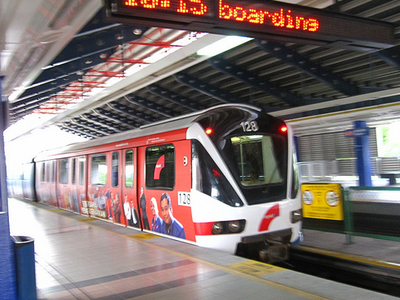 As the station is on a major expressway, it is well served by bus connections that take passengers to the areas of PJ Utara, Tropicana, Subang Jaya, and Sunway. It is also a local taxi hub. The station is built in a similar design to most of the other above-ground stations on the Kelana Jaya Line. The large roof over the platform level is reminiscent of traditional Malay kampung architectural design. In addition to the main station, there is a side building that connects to the platform level which houses more shops and connects to the pedestrian overhead bridge over the Damansara-Puchong Expressway. Here's the our members favorite photos of "Railway Stations in Kuala Lumpur". Upload your photo of Kelana Jaya LRT Station! Get in touch with 1 Touristlink members who want to visit Kelana Jaya LRT Station or with Nawabtanweer who already have been here.